Daniel Keating endured a cold and foggy Seattle evening to witness the Black Metal Warfare tour consisting of Watain, Mayhem, and Revenge. Our January 2015 Album of the Month: Napalm Death’s Apex Predator – Easy Meat. In position to be one of newest melodic metal beacons in America, Utah’s Visigoth were kind enough to give Matt Coe the good word. 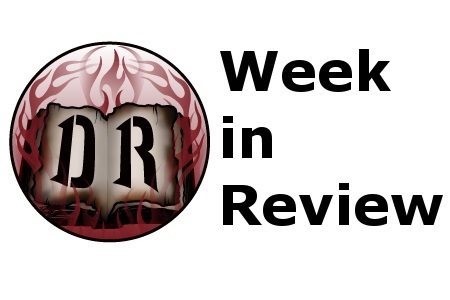 Reviews-a-plenty in our January 2015 Rapid Fires. Udo and his band, U.D.O. just keep on chugging along, don’t they? Read what the legendary German metal vocalist had to say about his band’s new album Decadent at this location. The Agonist don’t appear to be phased by the singer switch that rocked their lineup last year. Eye of Providence is a winner. Torche lays a rare egg with Restarter. Behemoth Jr., er, Hate, are back at it with Crusade Zero. The latest hot-shot band to emerge from Australia, Ur Draugr impress with The Wretched Ascetic. Unsigned upstarts Barishi kick out the jams with Endless Howl. Matt Coe sings the praises of Forevers’ Fallen Grace and their Ascending the Monolith effort. Dissection tribute band Thulcandra keep their melodic black metal stylings hearty with Ascension Lost. 2. Katatonia to release Sanctitude DVD/Blu-Ray in March. 3. Secrets of the Sky sign with Metal Blade. 4. Kiske/Somerville announce City of Heroes album details. 5. Blind Guardian stream their new album in full. 6. The Swedish Shining reveal their new album details. 7. Anthrax checks in from the studio. 8. Former Testament bass player Greg Christian launches Trinity Fallen. 9. The Sword begin recording new album. 10. Moonspell streams the title track from their most-excellent new album, Extinct.